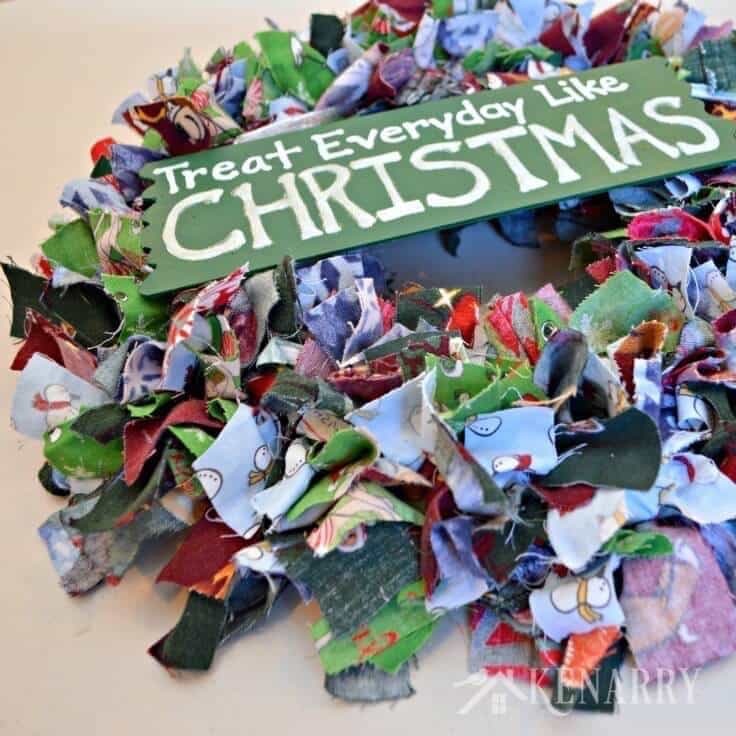 Upcycle old pajama pants or use scraps of colorful fabric to create a fun, festive and easy Scrap Fabric Christmas wreath plus get more handmade gift ideas for the holidays. 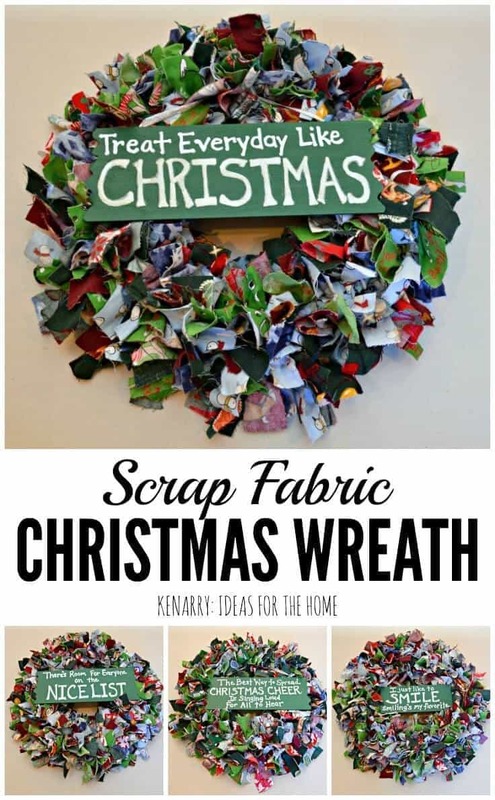 Learn how to make a Scrap Fabric Christmas Wreath as an easy homemade present for family and friends. 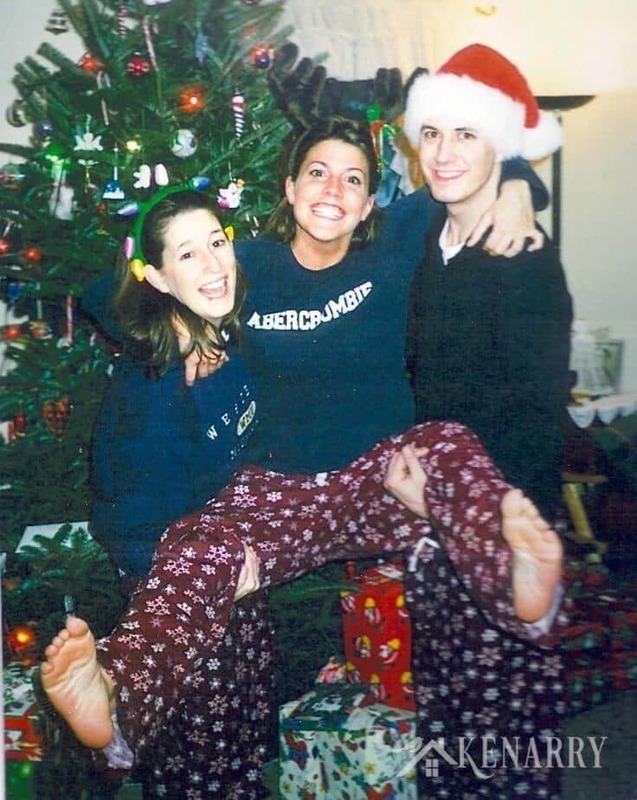 Many, many years ago, my family started a Christmas tradition of opening festive new pajama pants on Christmas Eve. I know it sounds like a cute idea for the kids, but my siblings and I were actually adults when this tradition started! It happened on accident. My youngest brother and I were in our early twenties and shopping before Christmas at Old Navy. We saw the cutest flannel blue pajama pants with snowflakes on them and each bought a pair to wear that night. Well, my younger sister, who happens to be between my brother and me in age, was appalled when she saw us in matching pajama pants. This tradition continued year after year with new matching pajama pants and slowly grew to include our older brother and his wife, our significant others, our parents and now even our children. After more years than I can count, we’ve amassed a wide array of pajama pants. There are some cotton, some flannel, some fleece pajamas in all different colors and seasonal themes. Snowmen – yup. Reindeer – you betcha. Christmas lights – of course! 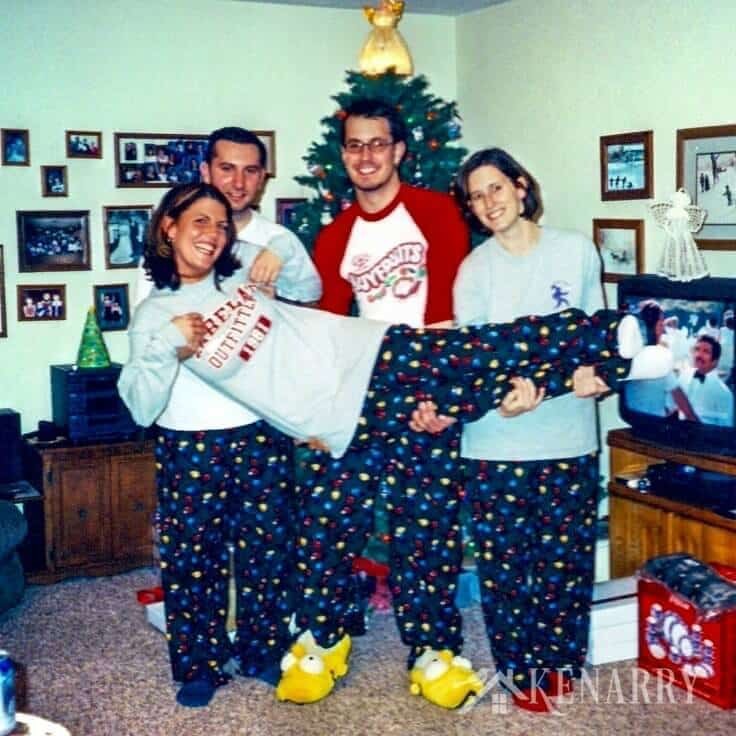 In fact the year we had Christmas light pajama pants was the first year my brother-in-law (who was my sister’s boyfriend at the time) participated. He had no idea what he was really getting himself into. My younger brother and I picked out the pajama pants that year and happened to find Christmas light boxer shorts. You can only imagine the look on his face when we all brought out the new Christmas jammies for that year and his were short! We told him those were his “training pants” and if he stuck around maybe he’d get the full-length ones next year. After we nearly fell over ourselves laughing with hysterics we brought out long pants for him and told him we were just kidding. Despite the craziness, he married my sister anyway! 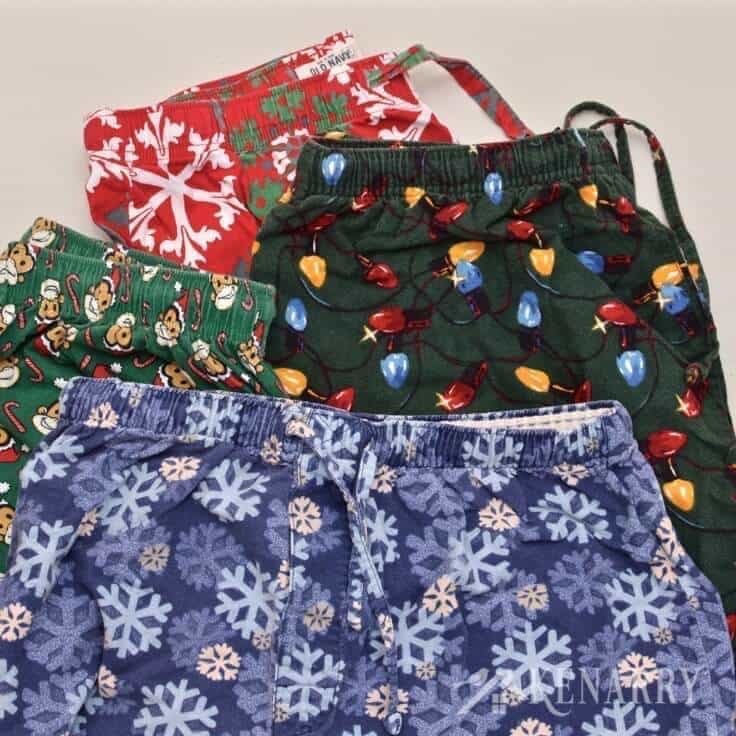 In time, many of our Christmas pajama pants have worn out or we just have too many to feasibly wear in one holiday season. My sister and I were thinking we ought to turn the Christmas jammies into something else but weren’t sure what to do with them. Then last fall, I came across the idea for making a Scrap Fabric Fall Wreath from This Mama Loves and immediately texted it to my sister. YES! We knew this would be the perfect way to turn our beloved pajamas into a DIY Christmas gift for our brothers. 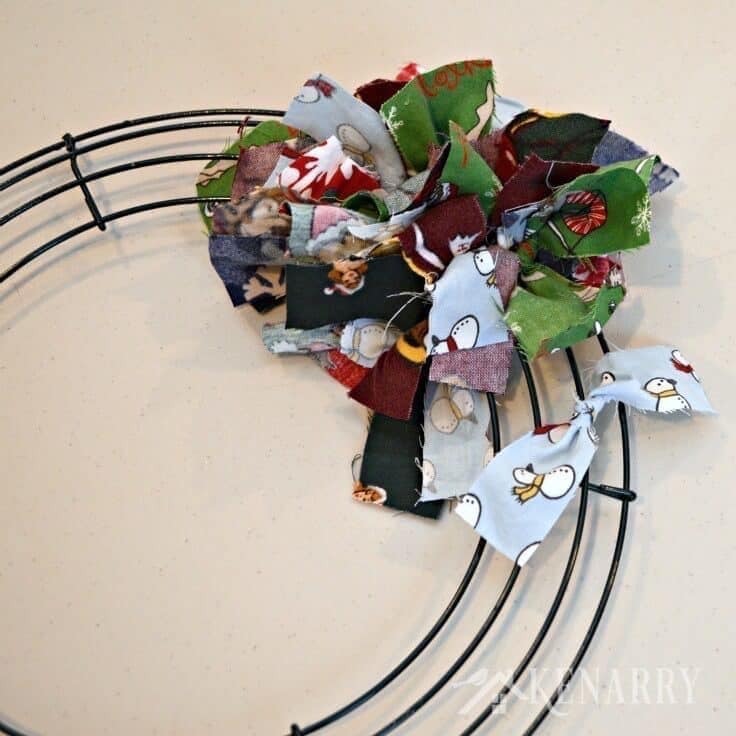 This beautiful DIY Fabric Garland is also a great way to use up any old fabric. 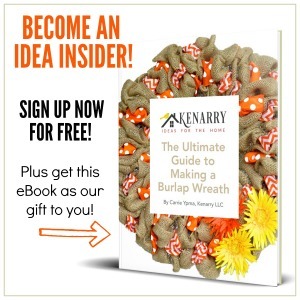 It’s incredibly easy to make a Scrap Fabric Christmas Wreath as a DIY gift for someone you love. This is actually one of those crafts that’s so easy you can do it while you’re watching a holiday movie. You just need a wire frame, scraps of fabric and something to embellish it. For our Scrap Fabric Christmas Wreaths, my sister and I chose to actually paint wood signs with quotes from Elf, one of our favorite Christmas movies! 1. Cut your fabric into strips. 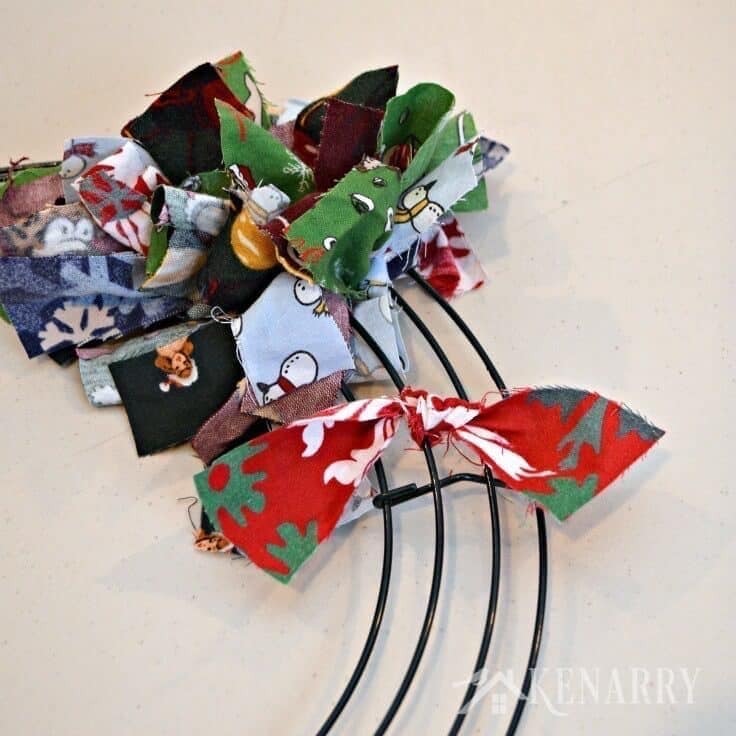 Using sharp scissors, cut your Christmas pajama pants or Christmas fabric into long strips. Ours were approximately 1 inch wide by 6-7 inches long. 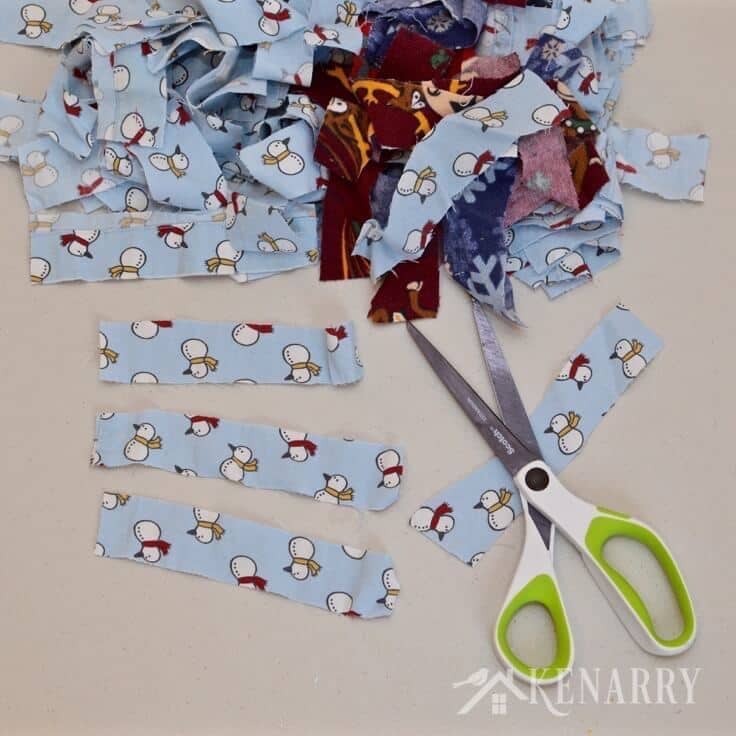 We didn’t worry about making them perfectly identical and just eye-balled it using strips we’d already cut as our template for cutting other scrap fabric strips. 2. Tie scrap fabric strips to the wire frame. 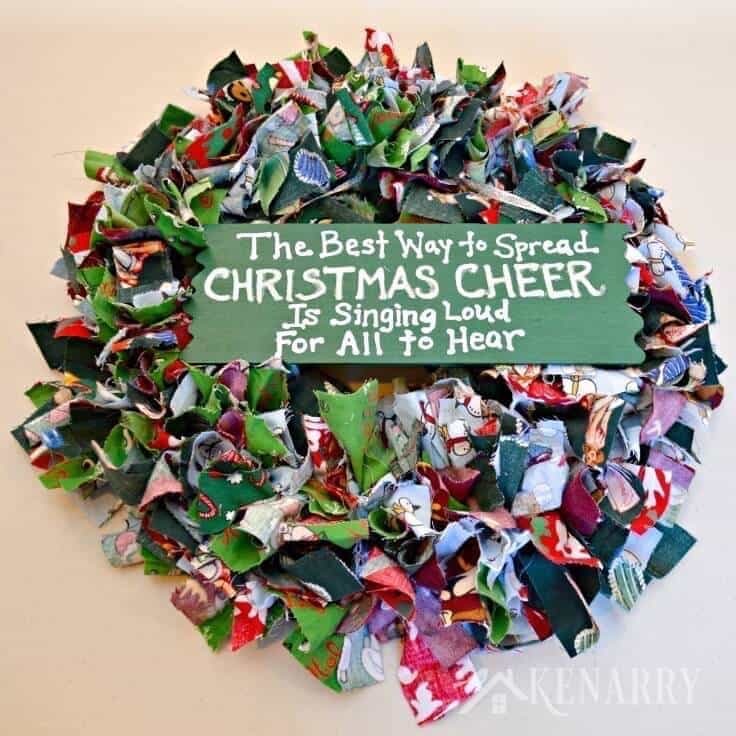 Starting anywhere around the wire wreath frame, begin to tie strips of Christmas scrap fabric to the four wires around the outer edge of the frame. You don’t need to worry about having a particular pattern, but do make sure you vary which style or color you use each time so you don’t end up with too much red or green in one place. 3. Paint Christmas signs. 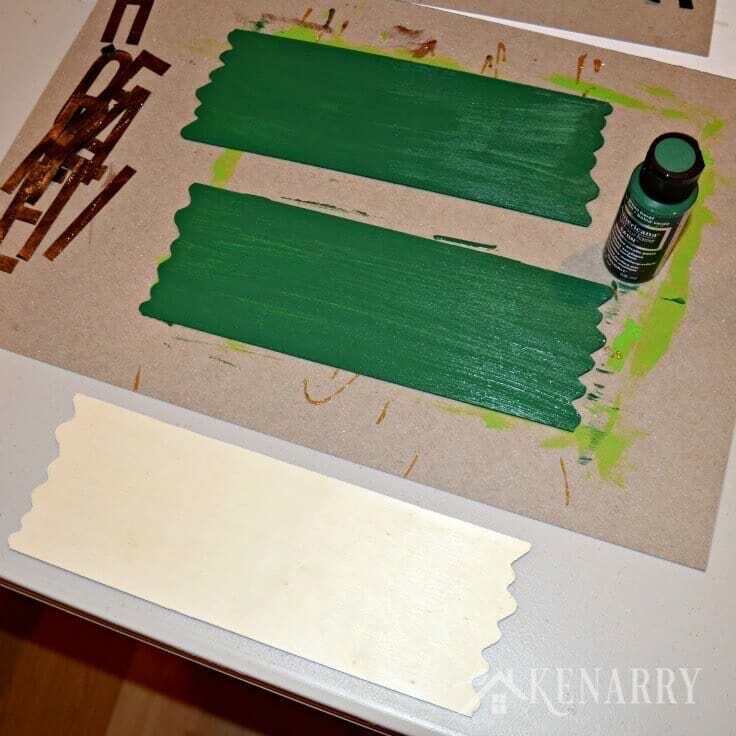 Using a wide craft brush, paint your unfinished wood sign with green acrylic craft paint. Allow it to dry then apply 1-2 more coats until you’re satisfied with the coverage. Once the paint has dried, lightly write your message on the signs with pencil making sure to center the message on your signs. Go over the pencil with a white paint pen. You may need to do a couple of coats of the white paint pen to get the letters filled in well. 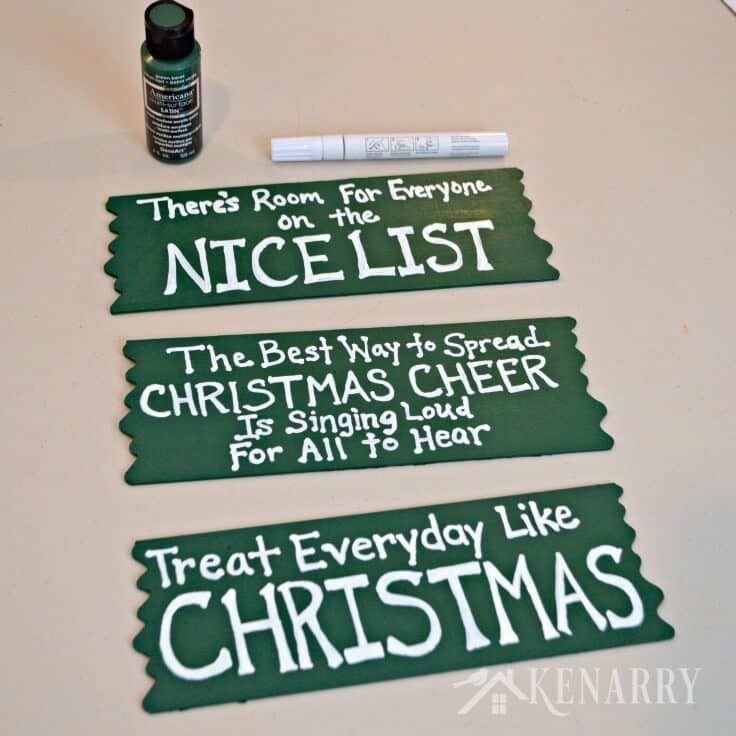 Lastly, once the white paint is dry, go over a word you want to emphasize with white or silver glittery puffy paint. You can see how it really makes the word POP when the sign is on the wreath. 4. 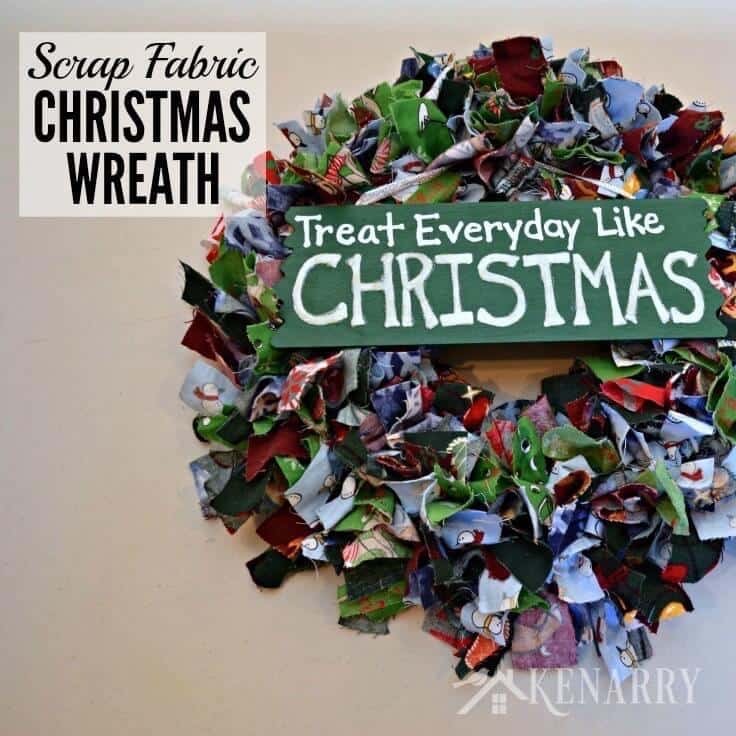 Attach the sign to the Scrap Fabric Christmas Wreath. Cut two long strips of silver ribbon per sign and attach the ribbon to the back of the sign using hot glue. Once the glue has dried you can tie the ends of the ribbon around the wire wreath frame to attach the sign. We ended up making four of these wreaths, two to give to our brothers, one for my sister and one for me. It’s very easy to do, but is a little time consuming. To get four Scrap Fabric Christmas Wreaths completed in time for my family’s Christmas celebration, we had to enlist my parents to help us. We even had my Dad tying on scraps of fabric! 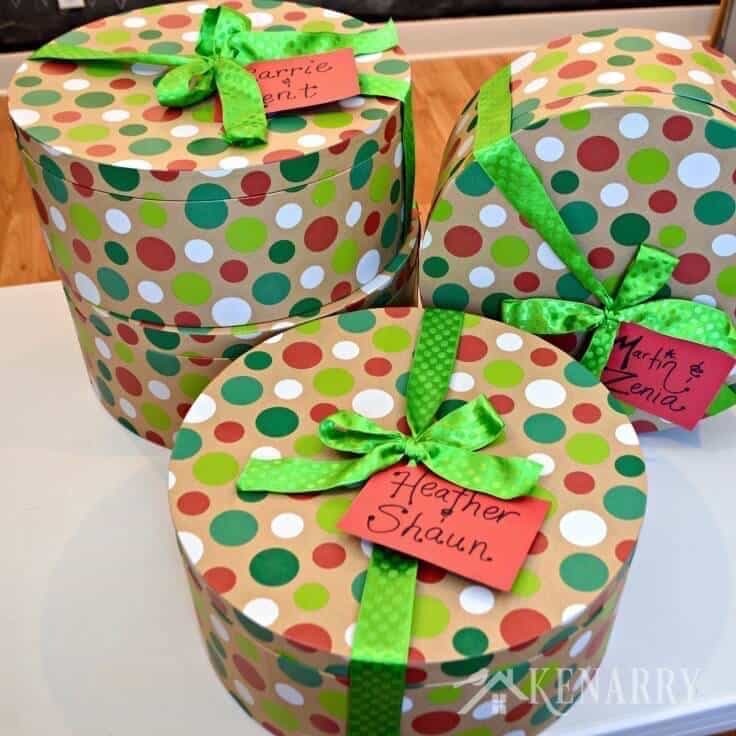 Once your Scrap Fabric Christmas Wreaths are ready, you can package them up to give as DIY gifts. We found large round festive boxes at Hobby Lobby that worked perfectly for this. Our brothers had no idea we were making each of them a Scrap Fabric Christmas Wreath out of the old pajama pants, so the look on their faces when they opened these bright packages was absolutely priceless. I can’t wait to see where they each choose to hang their Scrap Fabric Christmas Wreath this year. I know exactly where mine is going – by my front door for all to see! What will you be making for your friends and family this year? Please comment below and share. We’re always looking for new ideas. Love this idea, especially the use of the pajama pants. Now every time they look at the wreath, they can’t help but chuckle a little! Thanks for the inspiration! I know it makes me smile every time I look at mine, Pam. It was the first holiday decoration I put up this year! This is such a clever idea! I love that it has special meaning to you guys, too! Thanks, Meg! My siblings were so excited about them. It’s been a great way to recycle something into a precious reminder. Oh my gosh! This is so funny and cute! I love this tradition. 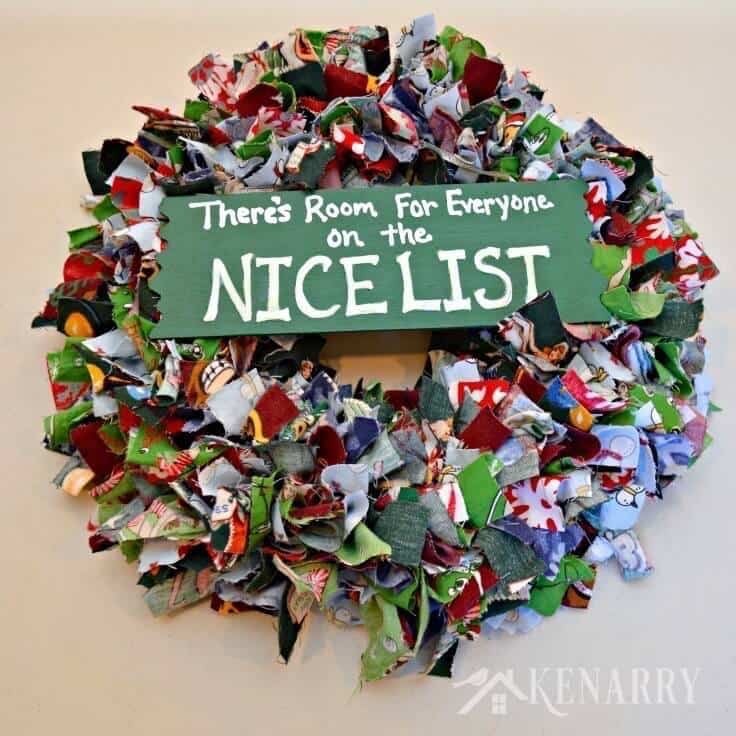 You idea of making them into wreaths is perfect!!! Also, I started a wreath like this and that’s a lot of tying! LOL I stopped!! Thanks for sharing. Thanks so much, Bre! It’s one of my favorite gifts I ever made for Christmas – I’m just glad I made one for myself too! I absolutely love the story behind your wreath, Carrie! Your family sounds hilarious and your wreaths turned out really cute. Have made many of these wreaths in the past from all kinds of scrap fabrics for all occasions. I also have used same scraps to decorate garlands (with & without lights) the same way…. very cute & festive! What a fantastic idea, Phyllis! I hadn’t thought about using the same technique to decorate garlands and to add lights. I bet those turn out so pretty. Thanks for sharing. I was just smiling through your whole post – what an awesome tradition (and so funny some of the memories)! 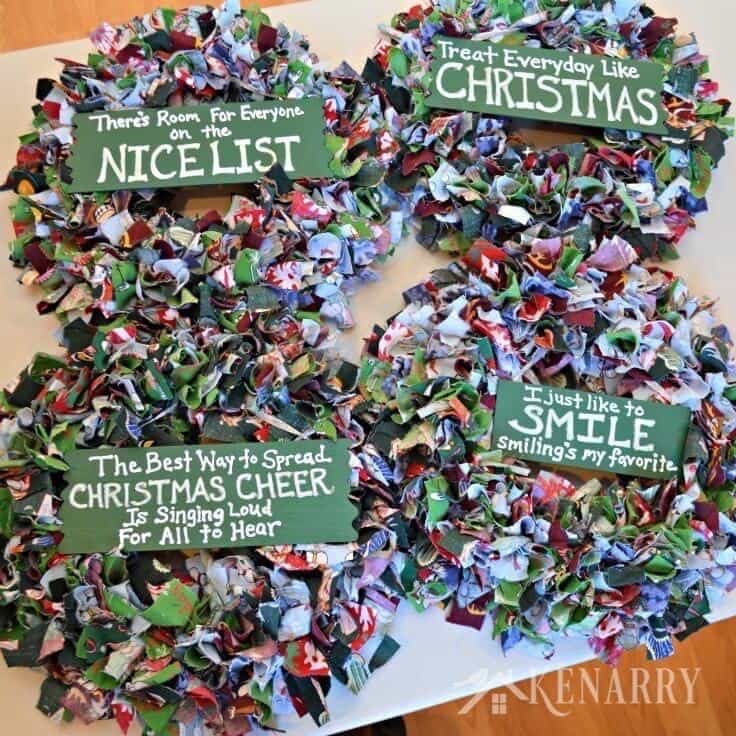 These wreaths are the perfect gift for your siblings!! I have a pile of leftover Christmas fabric from my stockings two years ago – now you have me thinking…. You’re so sweet, Jenny! I’m glad the post made you smile. My siblings and I sure have a lot of fun together – that’s for sure! Can’t wait to see what you create from your leftover Christmas fabric. I bet it will be amazing. 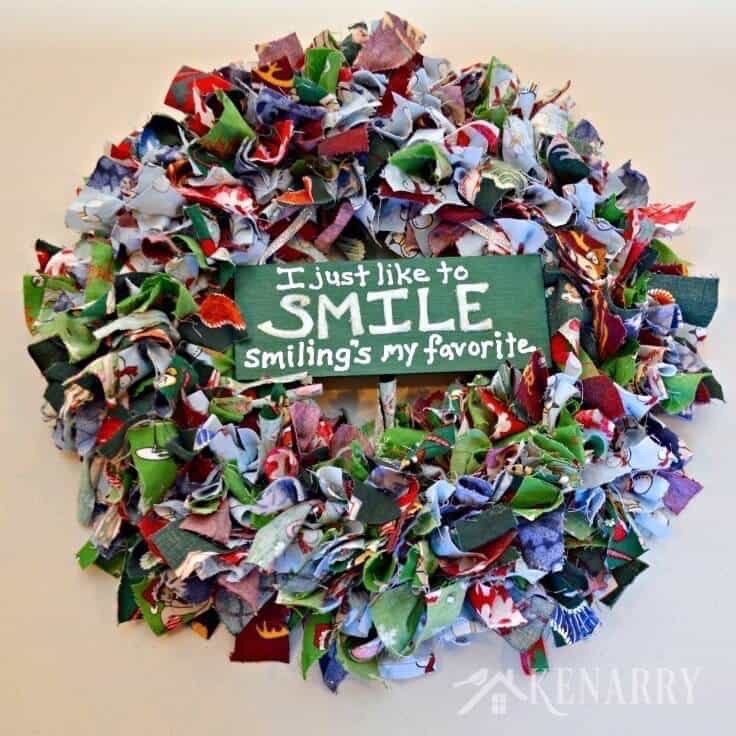 A lovely wreath and a great way to reuse fabric scraps! Thank you for sharing! Teresa, thank you so much for the invitation. I just stopped by and linked up with you. Hope your readers enjoy it. Wonderful! Thank you so much for sharing our post on Pinterest, Teresa. I love the wreath but I love your family photos even more – thanks for sharing! You’re so sweet! I’m so glad my brother and sister let me share the pics on the world wide web. They’re my favorite part of the story too. This is so cute and I love how easy it is! I think I’m going to try making one! Thanks so much for sharing at Share The Wealth Sunday and I hope you’ll join us for an all new party tonight! Lisa, it’s SO easy to make this wreath! You should definitely give it a try. It’s a perfect project to work on while watching a movie or binge watching TV. This is such a cute idea, Carrie! I love that you guys took a tradition and turned it into something you can enjoy for years to come. How fun! And how cute are you and your siblings in those pics! ?